System discharges bins of rubber pellets. 4,000# capacity, 45° discharge angle. 111″ discharge height with 15” projection. Twin large bore hydraulic pivot cylinders for smooth rotation of dump carriage. 3″ diameter chrome plated pivot shaft with four bolt spherical piloted flange bearings. Heavy-duty I-beam and tubular steel frame construction for durability. 68″ wide x 47″ deep bucket with welded angle reinforcements for rigidity. 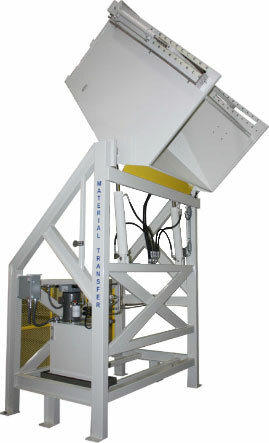 Custom hydraulic container clamping system automatically locks metal bins in position during the discharge cycle. Premium quality 5 GPM Parker hydraulic unit with a 5 HP TEFC motor. Electrical components wired to a NEMA 12 Hoffman junction box. Rigid conduit used where possible. Hydraulic unit designed for continuous duty cycle with 20 gallon hydraulic reservoir, and oil cooler.